Long ago, in a faraway country Europe, a horde of blood-barbarians called themselves Voivods. It is said that they destroyed entire villages, impaled the villagers, and then celebrated their victory by drinking their victims’ blood. This tale of horror and brutality was unfolded within the nightmares of Michael Langevin, better known as Away, visionary drummer of Voivod. Away used these dreams as the foundation for the whole Voivod concept, a concept that has been continuously evolving throughout the band’s six-year existence. Away’s talents are not restricted to music alone. He is also a gifted artist with a dynamic and totally unique style of drawing. His bizarre pictures serve as doorways into his mind and it is no accident that his artwork adorns the covers of all three Voivod albums. 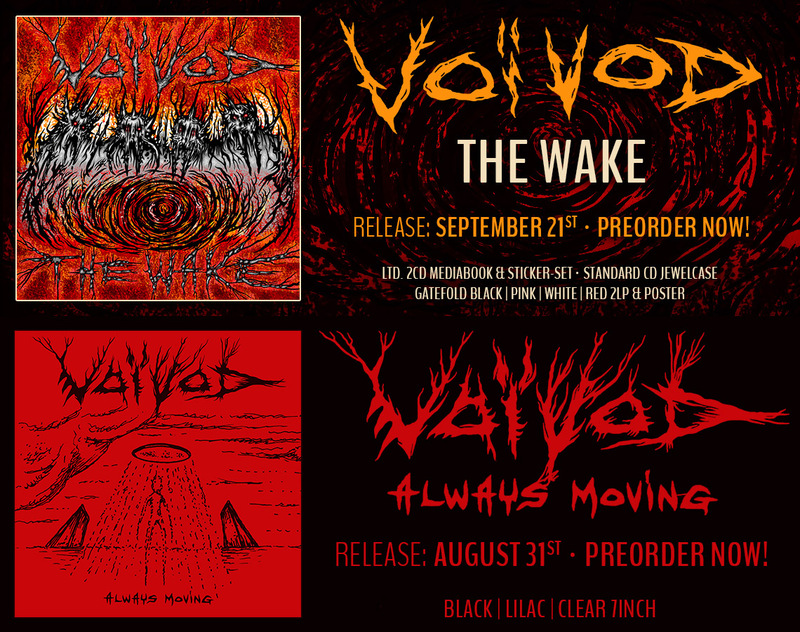 These album covers depict the coming of age of the Voivod creature, but in actuality, they also characterize the progress of Voivod, the band. “The War and Pain (Metal Blade) album was just our beginning,” says Away.” We were not very strong at the time but we wanted to be. This is represented by the very primitive Voivod creature. He is just awakening from a nuclear war and doesn’t have many weapons, but he is ready to fight and prove to the world that he can become something very strong. The third sequence in the Voivod saga has just been revealed on the cover of the brand new opus, Killing Technology (Combat/Noise). Killing Technology is certainly a milestone for Voivod. The last few years have been spent cultivating and refining the Voivod sound. These years of hard work have finally paid off as Voivod have finally laid to rest their status of musical nomads. I feel that the band has reached the elusive plateau of self-actualization. The music they are producing now is true Voivod. The new album shows them to have a unique sound and style, something that not many bands can boast in this age of assembly-line death metal. Perhaps the biggest benefit of Voivod’s brief European trek was their opportunity to work with producer Harris Johns, most noted for his work with Noise label mates Kreator and Helloween.” He is really a good professional worker,” says Away. ” He gave us a lot of ideas, he is a song alchemist.” This was the first time the band ever enlisted the services of a professional knob twiddler. The band has surely come a long way since their formation back in the summer of 1981. It was guitarist Piggy who took the iniative of forming the band. Piggy had been searching for several wild musicians to start a band with, but finding the right people proved to be difficult. His luck changed when he stumbled across Blacky in a local pub. Blacky quickly agreed to play bass in Piggy’s band. But there was one slight problem: Blacky didn’t know how to play bass! Fortunately, Piggy was musically adept and he took Blacky under his wing. Blacky knew Away from high school and the trio joined forces to harvest their own brand of noise. It didn’t take long before problems struck.” Everything went wrong because nobody could play,” recalls Away. “Piggy was the only true musician.” Blacky and Away simply needed time to develop their skills, so as a result the band split up for a one-year period. In November of 1982 they reformed and Voivod was officially born. Two months later they found a horrible creature whom they called Snake. Now Voivod had the throat to propel their devastating power and sound. By now, I’m sure you’re all wondering where these French Canadians came up with their lovable little nicknames. “We got these names before the band formed,” says Away. “People gave us these names because they fit perfectly with each of our personalities. Now they have become our real names, nobody calls us by our old names anymore. September 11, 1984 is a date that will forever be inscribed in the annals of thrash metal history, for this is the day that Metal Blade released War and Pain to an unsuspecting underground. The album was received very well by both the fans and the press, although Voivod became more of a cult interest than a household name. The year 1985 started as a nightmare for Voivod. A major falling out with Metal Blade resulted in a year-and-a-half of inactivity, with their only release being a self-distributed live tape called Morgoth Invasion. But not wanting to be left for dead, the quartet financed the recording of nine new songs. It was these tracks, collectively known as RRROOOAAARRR, that persuaded Noise Records of West Germany to offer Voivod a three-year, three album deal. This signing held particular significance for Noise as they expanded their horizons by signing a non-European band. “Noise is the best company we could have signed with considering the type we play,” says Away.” We’re not in a hurry to sign with a major label. It’s not that we’re not ready but we feel they are not ready for our kind of music. They really don’t know how to manage and promote speed metal bands.” Away feels the band’s long period of inactivity hurt their momentum, but the surprisingly strong sales of RRROOOAAARR proved otherwise. 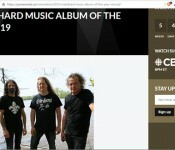 It must be difficult for a band from your area, Northern Quebec, to communicate with people and be heard. “Yes, definitely,” Away agrees, “Quebec is a separate part of Canada. We speak French. We are different from all of Canada’s English-speaking people and we are different from Americans. 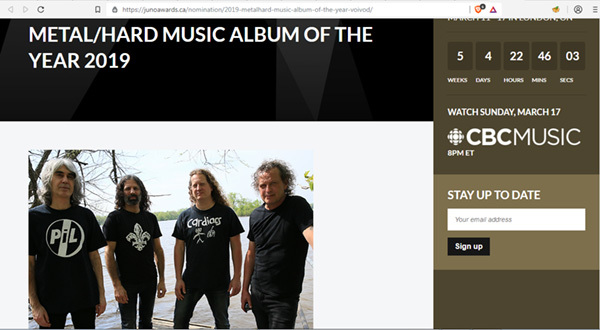 It has taken us a long time to become known and the fact that we are French and live in Quebec has not been to our advantage.” In contrast, it’s Voivod who have been instrumental in placing Quebec on the international metal map. On November 30, 1985, the band headlined the now-legendary ‘World War III’ festival. About 3,000 fans from all parts of Canada and the U.S. poured into Montreal for a night of thrashing with Voivod, Celtic Frost, Destruction, Possessed, and Nasty Savage. Currently, the warriors of ice are in the midst of an extensive U.S. tour that will take them from coast to coast. A Voivod live show is the next best thing to nuclear war. Be sure and catch the boys at your favorite local bomb shelter. Warning: No one will be admitted without gas mask.